Blog F2.0: Amazon Watch: Where were you last week? Amazon Watch: Where were you last week? Subject: Where were you last week? Where were you last week? Were you deep in the Brazilian Amazon, fighting for justice? Last week our Brazil field team engaged in a protest with some 150 leaders from four indigenous groups and allied riverine communities. These courageous Amazon defenders occupied a major work camp and halted construction on the controversial Belo Monte dam on the Xingu River. The fight to stop this monstrosity continues. If you've taken action or made a contribution to stop Belo Monte and steer Brazil towards a clean energy future that respects people and nature, then YOU were right there with us last week in the Amazon. Your continued support is needed more than ever. Please add your power to this fight with a contribution today. Your support backs the strength and courage of these rainforest defenders when they go up against the powerful resources and ruthless players that are desperate to move projects like the Belo Monte dam forward. Your support helps legendary Chief Raoni and the Kayapo warriors – and all the indigenous, riverine and local communities fighting the project – stand strong against this relentless road toward forced displacement. Your support honors the spirit of 13-year old Luciano Gouvela de Moraes Silva who shared his poem with you last week expressing the horror of what's happening to his home. 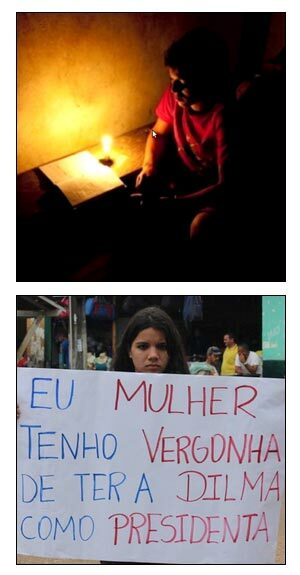 Your support rats out nasty spies and decries the injustice done to 15-year-old Karoline Militão, whose story is one of many of displacement on the Xingu. Your support puts our team in the field and keeps this critical battle going. We will not give up. We will stand with communities that are fighting for their homes, families, lands and livelihoods. We will continue to be an integral partner to the Movimento Xingu Vivo and we will continue to defend the Amazon and support these people – because you make it possible. Every day is important, every action counts, every dollar makes a difference. Please help us continue this fight by making a generous contribution today. Thank you for your continued support, and for standing with us when we need it most. Copyright (C) 2000 – 2013 Amazon Watch All rights reserved.